It has been brought to my attention by PIRC that Barclays are leaving £2 billion of bonuses out of their accounts within IFRS rules. Taken together with another flaw in IFRS, it appears that Barclay’s true profit is about half that allowed under the rules. Barclays is still leaving bonuses of more than £2.0bn out of its accounts, nearly three times the dividend for 2011 (£730m), according to analysis by PIRC. PIRC research last year identified that at least £1.4bn of deferred bonuses payable were not carried as a liability or disclosed by Barclays in respect of 2010 and previous years. Barclays said that it was nevertheless complying with international accounting standards (IFRS) under which a liability to employees does not count as a liability. That was contrary to the requirement of Section 411 of the Companies Act which requires amounts paid and payable to employees be disclosed, independently of whether IFRS or UK GAAP was used. It then became clear that this problem was common with other banks. The amount missing in 2010 was in fact £1.7bn, higher than PIRC’s estimate. For 2011 the missing sum is now £2.0bn. PIRC notes that Barclays is calculating return on equity and other measures using IFRS as headline performance. The disclosures today therefore show the extent to which key performance measures are distorted by complying with IFRS. Taking account of this, and £2.3bn own credit gain, another discredited IFRS quirk, Barclays true profit for 2011 is only £2,914m[,] not the £5,879m IFRS number, nor the group’s own “adjusted” number of £5,590m. Clearly, IFRS is not only distorting profits by not including bonuses payable, but it is distorting the profits on which these bonuses have been based in the first place. The auditing of banks’ accounts, however, is fundamentally flawed in itself. 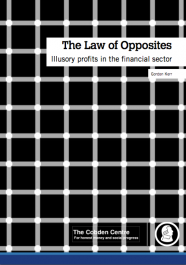 The IFRS accounting system itself has proved to be damagingly pro-cyclical, and the ability to pay genuine (and genuinely large) bonuses out of purely paper profits, which are never subsequently realised, is at the heart of both the bonuses that cause such public and political outrage, and the reason why bank management consistently does so well when bank shareholders do so badly. IFRS encourages banks not to deduct staff compensation from profits… The public are furious about the injustices manufactured by the banking system, and they are right to be, but how much greater is the injustice if grotesque bonuses are based on false profits? Profits and bonuses earned without privilege by creating value for other people are right and proper. Bonuses based on poor accounting in a system bailed out by the taxpayer are not. The Government should take action to put bank accounting on a true and fair basis at the earliest moment.